The ever-increasing extreme weather events in recent times have resulted in more disasters affecting humans and their environment. Most homes can survive a good lashing, with little if any damage. Do you Believe that your home is storm proof? The threat to our home though is drastically increased when wind-blown projectiles batter the house, compromising its structural integrity. That’s when real damage is likely. Fast moving projectiles can tear a roof open and the ensuing gale force winds can peel your roof away. Not a comforting thought when you consider that our homes are supposed to protect us from the elements. Tree Lopping Pros will apply the unique set of skills needed to carefully lift away any part of the tree that has caused damage to your property. Whether we use a crane or rope/chain rigging techniques depends on the size of the tree and the nature of the damage. Much more damage can be caused to a home for example if the correct equipment and method are not used. We recently attended a home where a very large tree had punched a hole through the roof allowing rain to saturate one room in the house. Unfortunately, the householder had hired a tree service provider with no background in work of this nature. As a consequence, more damage was done to the roof resulting in the entire house being flooded. Add to this the further complication with the householder’s insurance company. The Homeowner hired a company who did not specialise in this area and therefore nullified the insurance on the subsequent damage. The whole experience was much more traumatic than it needed to be. Don’t procrastinate! Get the repairs done in favourable conditions. The Tree Will Come Down One Way or Another! When it comes to trees in close proximity to the home this adage has much relevance. It pays to get your trees inspected for health and trim threatening branches. Perhaps they’re overhanging your home, posing a threat to your family. Or the tree may simply need to be removed. Not all trees show visible signs that they are diseased or dying. Countless times we have cleared fallen trees that were considered to be healthy but were not, toppling in mildly stormy weather. Often these trees have been hollowed out by termites, rot or any of the multitudes of conditions that adversely affect tree health. Seemingly healthy but were found to be not so healthy and sadly all too often this becomes apparent only after it has come crashing down. Tree Lopping Pros will generate an arborist report, detailing the condition of your trees and perform any necessary trimming or removal to keep you safe. You can greatly reduce the potential for damage to your physical assets and most importantly preserve life and limb by taking the necessary practical steps to ensure you are disaster ready. We hope this information has been helpful and are willing to talk shop anytime you call. Living in Brisbane, you’re bound to run into some intense summer storms over the summer period (and occasionally throughout the winter period as well!). Queensland is known for her raging storms, where hail and strong winds can blow through with hardly a moment’s notice and cause lots of havocs for the residents left to defend themselves and their properties. These storms can be a beautiful display of nature’s force and strength, but if they cause damage to your home or property, they can also cause a lot of mental and emotional pain as you deal with the cleanup. One of the most common problems homeowners face as a result of storms is havoc in their front or back garden as a result of the wild weather’s impacts. You may find that a sizeable tree, or multiple trees, has been adversely affected as the result of a big storm. If this is the case, it’s crucial to understand just how dangerous it can be if you try to move any of the fallen tree branches or trunks yourself. There’s a reason power companies run so many advertisements during the summer about the risks of fallen trees and power lines – if a tree is to come down due to a storm, you run the risk of electrocution and permanent damage, or even death, if you try to move it without having an expert examine it and decide on the safest course of action to remove it. Reacting to a fallen tree as the result of a storm takes the same kind of common sense as reacting to any other kind of emergency. Firstly, remember that this is not a situation where you should try to ‘do it yourself’. There are experts available for emergency tree removal and storm damage in much the same way as there are ambulances with paramedics on standby, so don’t hesitate to pick up the phone and call in those who are fit to deal with it rather than attempting to solve the problem yourself – the results could be fatal. Not only can storm damage to trees lead to dangerous scenarios, but the overall extent of the storm’s damage to your property can result in a huge mess of fallen branches. By hiring a team of tree removal and care experts, you can trust in their abilities to clean your property up post-storm carefully and thoroughly and restore it to the way it was before the storm rolled through. They’ll sweep up all debris and check for any further landscaping damage to ensure your property is back to working order. 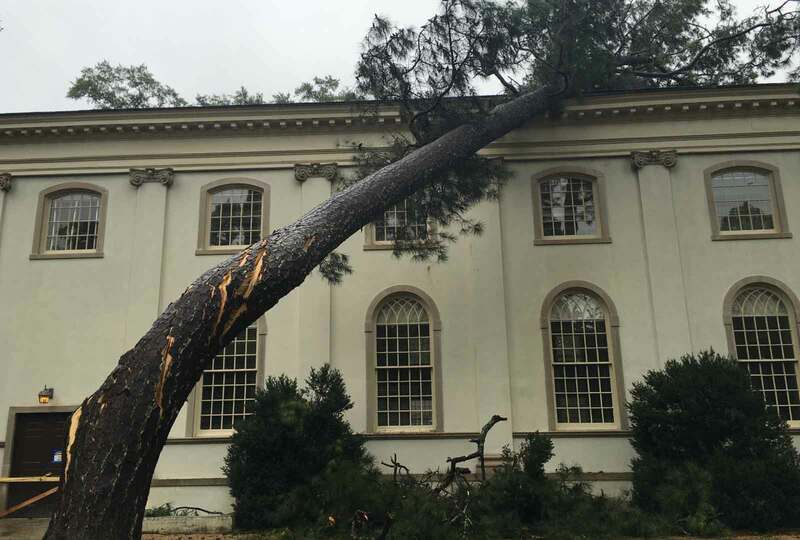 You’ll be surprised to discover that many tree care companies are working around the clock in the aftermath of a large storm. Although you may hesitate to call them during the middle of the night, if you find yourself in an emergency situation with a damaged tree that runs the risk of causing further damage, don’t think twice before picking up the phone and calling an expert. Chances are, they’re already hard at work and will be able to help you before the sun rises! Broken branches can become a threat to the family home or to personal safety once they’re dislodged by the storm’s power. Not only can someone who’s specifically trained in emergency storm response evaluate the situation and remove the broken branches with minimal risk to their person or to your property, but they’ll also bring with them the equipment that’s required to chip any removed, dead or damaged branches so you’re not left with a clean-up job on your hands. They can also respond to damaged trees by evaluating its health and lopping branches that have been dislodged by the storm, making decisions that could allow for your beautiful trees to be saved whilst still dealing with the problems caused by the storm and removing any risk of future hazards as a result. As the summer storm season approaches, it may be a wise and worthy investment to hire the services of a tree lopping professional to evaluate your property. An experienced tree lopper will be able to take a critical look at the health and placement of the trees on your grounds, checking for strength and assessing potential risks that could arise as a result of the summer storms that are sure to roll in. Arborists are equipped to identify trees with deteriorating health, which can leave their trunks and branches weakened and more at risk of falling during strong winds. By having these branches lopped ahead of time and potentially removing any old trees whose cores are no longer trustworthy, you may be able to avoid any storm damage that could have wreaked havoc on your property. This also protects your home and possessions, as it’s all too common for falling branches to – strategically or accidentally – fall right on top of the beautiful family car! Another element to consider during the storm season is the safety of your pets. Many household pets get frightened by these storms when they hit, and as a result, their behaviour can be erratic. A tree lopping team is on hand to be called in during emergencies, even if the emergency is your cat stuck up a tree as a storm approaches. They’ll be equipped with the tools they need to safely convince kitty to come on down and back inside before the storm begins – nobody wants to deal with a wet cat or worry about a family pet during a crazy storm! Next time you see the storm clouds on the horizon, make sure you’ve got the name and contact details of a trusted tree lopping and removal service on hand. Although you may be one of the lucky ones whose trees withstand the tropical forces heading their way, you never know when you’ll need to rely on the services of emergency storm professionals who will be best equipped to deal with whatever scenario you and your trees find themselves in. Our pricing is transparent and highly competitive. We do our best to take the guesswork out of the final cost from the beginning. Our reputation is everything to us. You only need to read our customers reviews to see how much we are appreciated. Tree Lopping Professionals are licensed and insured.